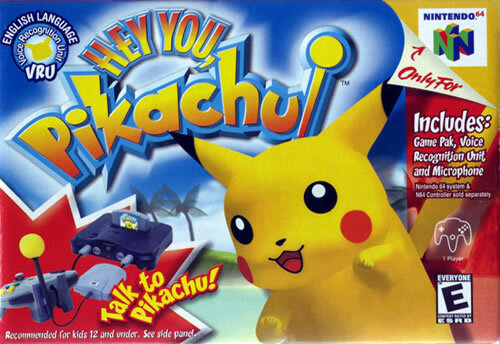 Released on Nintendo 64, "Hey You, Pikachu!" is a 3D virtual pet game, that introduces for the first time, the VRU (Voice Recognition Unit) allowing the player to interact with Pikachu through actual voice commands. The game offers quite good graphics, with Pikachu having a wide range of animations, making it feel somewhat alive and real. "Hey You, Pikachu!" successfully portrays the game genre, with soothing music themes and sounds, that fit its innocent vibes perfectly, as it mainly targets the young audience. Moreover, the game takes place between Viridian City and Pewter City, where the player is asked to test one of Professor Oak's new inventions called "The PokéHelper". This invention allows the interaction with the present Pokémon verbally. The player encounters Pikachu, in the Viridian Forest, and forms a strong bond with it. Through the rest of the game, Pikachu starts living at the player's home and together they complete several missions and adventures, on a daily basis. The missions fall under three level categories (Pikachu's Discovery Days, Pikachu's Play Days and Pikachu's Daring Days) that are accessible from different areas of the player's house. Within the missions, Pikachu is ordered to interact with its surrounding, including objects and other Pokémon, through a wide variety of vocal commands, as it can understand nearly 200 words. When exactly a year of in game time has passed, Professor Oak declares that Pikachu, as a wild Pokémon, has to be released. The player will have to say goodbye and abandon Pikachu at the first place they met in, and then the credits show. Although the game supposedly ended, after the credits, Pikachu will return to the player's home, and the game will continue as usual, presumably to quell the tears of the trainer that just parted with him. Professor Oak: A very important character in the Pokémon games and the anime series. He's a Pokémon Professor who lives in the Kanto region and studies the relationships between Pokémon and Humans. Professor Oak is notorious for his research on wild Pokémon and the different inventions he's come up with, for example the PokéHelper the player uses in "Hey You, Pikachu!" in order to help the professor with his research. Within the game he also reappears several times during the missions, commenting on the mission itself, the player's actions and giving advice. The player's Mom: She appears at the start of the game and hands the player his PokéHelper while reminding him of the test he has to conduct with Professor Oak. The player: Unlike almost all the rest of the Pokémon games, the player in "Hey You, Pikachu!" Has no physical image nor are we given any description of his/her looks. All we know about the player is that he's a local from the area between Viridian City and Pewter City, who helps Professor Oak with his research. The player befriends Pikachu, with whom he shares days of adventure and fun. 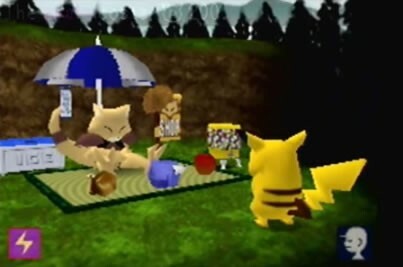 Although Pikachu is the one doing all the actions on screen, it mainly interacts with its environment under the player's commands and is affected by their words. Viridian Forest : A thick forest located between Viridian City and Pewter City. 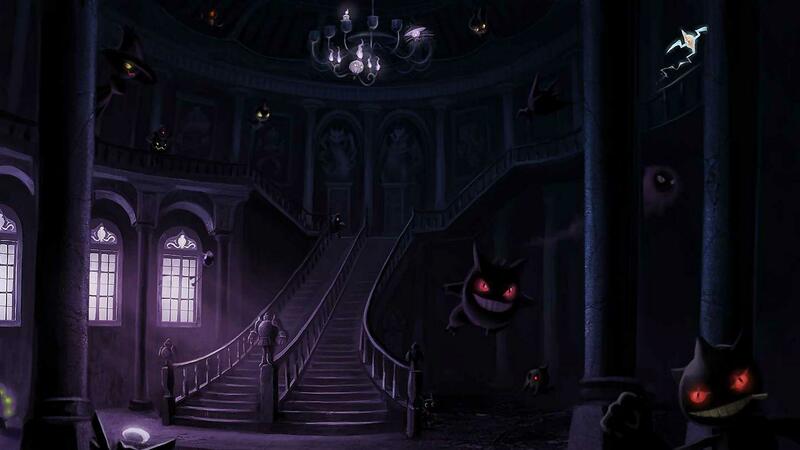 It is the first place where the player met Pikachu, and where he was given basic training by Professor Oak. The "Caring for Caterpie" activity takes place in Viridian Forest. Ochre Woods : A large Forest portrayed during the fall season. Both "Gone Fishing" and "Pokémon Picnic" missions can take place in the Ochre Woods. It is a great place to farm crops and the location of Abra's Shop. The woods also contain some fun features as the secret caves, the Togepi egg that will hatch after a number of missions and the dancing Magnemite. Ochre Fishing Spot : The fishing spot in Ochre Woods. Seaking can be caught here. Springleaf Fields : A grassy area with few scattered flowers and trees. The "Field Trip" activities can take place in Springleaf Fields, which is a great place to farm raspberries and sunflowers. In addition, a tree shaped Abra's Shop can also be found here. Cobalt Fishing Spot : The fishing spot in the Cobalt Coast. It's considered the best fishing spot in game. Kingler, Krabby and Goldeen can be caught here. Olivine Fishing Spot : The fishing spot in the Olivine Lake. A better fishing spot than the one in Ochre woods, but still inferior to the Cobalt Fishing Spot. Dratini can be caught here. Cobalt Island : A small Island filled with treasures. It is only unlocked after breaking the piñata three times at the "Piñata Party" activity. The "Treasure Hunt" activity takes place on the island. When Pikachu is near a treasure, the player can order it to dig it up and then hit it with thunderbolt to open in. The island is also a great place to farm coconuts, bananas and spiny shells. Cobalt Coast : A sunny beach where the "Piñata Party" activity takes place. There is one more secret location that can be unlocked within this level, by saying its name at the map screen, and it is Professor Oak's Special Training. 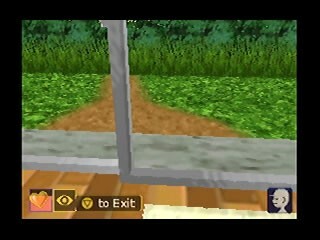 It is first accessed when Professor Oak tries to teach the player how to use the different view modes, and it can only be replayed through this method. Pokémon Picnic: Aided by the player, Pikachu has to help Bulbasaur collect four ingredients ( three different ones of which one is doubled) which are essential for Bulbasaur's meal preperation. Once an ingredient is found, it can be sent to Bulbasaur through Magnemite. At the end of the mission, the player gets to watch the reaction of the Pokémon to Bulbasaur's meals. Caring For Caterpie: As the name suggests, Pikachu has to take care of a number of Caterpie (1-5). Pikachu and the player have to keep the Caterpie busy all while feeding them. Once a Caterpie is fed a certain amount of bloomed roses, it will evolve into a Metapod that will evolve later on into a Butterfree. At the end of the mission, the Butterfree wil award Pikachu a colored jewel, a balloon, a glass marble or a ruby. Little Lost Poliwag: The Player and Pikachu have to uncover the location of five lost Poliwag and safely return them home, with the help of Squirtle. The challenging part of these missions is that Pikachu sometimes falls into the waters, the dead ends that might lead to more lost Poliwag and the Haunter that scares off many of them. The Piñata Party: Pikachu has to smack open a Pokéball. Successfully doing so for three times makes Venusaur award Pikachu with a Harmonica that invokes Lapres. Lapras ,then, takes both the player and Pikachu to Cobalt Island. Treasure Hunt: Within this mission Pikachu has to dig up treasures and open them up. The treasures contain a variety of rewards, including a toy sword that can be used to decorate the player's room. This mission can only be played after successfully hitting the piñata three times and unlocking the island. Gone Fishing: These missions take place at the three different fishing spots. Pikachu has to catch different water Pokémon that come in different sizes, and gets awarded a fishing flag upon catching a large size Pokémon. Field Trip: Unlike the rest of the missions, this one doesn't have any goal or purpose, other than the player and pikachu relax and have fun. Pikachu can interact with Oddish there by greeting and watering them. The watered Oddish evolve into Vileplume, except a weird one that keeps only growing in size, reaching ten times Pikachu's size. - Carrot: Pikachu will generally eat carrots it finds. - Corn: It can be turned into popcorn if Pikachu uses Thundershock or Thunderbolt on it. - Onion: selling one will make a lot available at the player's home garden. Also, Pikachu sneezes when it smells onion. - Pumpkin: Pikachu throws them away as it despises them. - Sweet Potatoes: Using Thunderbolt on them will make them fried, and Pikachu will eat them. Apple : found in Orche Woods. Cattail : found in the Viridian Forest. Jumbo Shrooms : Found in Orche Woods. Can be cooked and eaten by Pikachu. Lily : A flower that can be found in Viridian Forest and Springleaf Fields. Can be eaten by Pikachu. Mushrooms : Found in Orche Woods and Springleaf Fields. Can be cooked and eaten by Pikachu. Rosebud : Used to feed the Caterpie, the Rosebud flowers can only be found on the trees of the Viridian Forest. Skunk Flower : Found in the Viridian Forest and Springleaf Fields. Once one is sold, another appears at the player's home garden. Sunflowers : Can be found in the Springleaf Fields. Once sold, a sunflower will appear at the player's home garden, in a pot. Sunny Shroom : Mushrooms that Pikachu can eat. Ruby : Awarded by the Butterfree. Sapphire : Found in treasure chests. Topaz : Earned after watering five Oddish and evolving them into Vileplume. PokéHelper : A device that helps the player locate Pikachu and understand its mood. Pika : The currency used in the game. 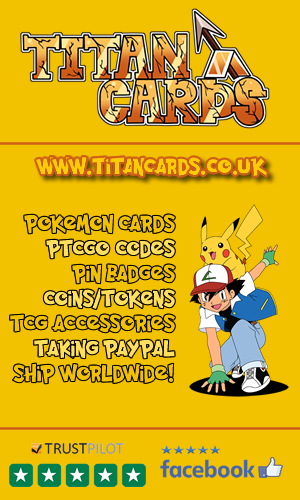 Extra Pika can be earned by selling items awarded in missions or collected through them. Beach Ball : Used to play with Pikachu. Toolbox : Serves as the main common item inventory. Light bulb : Bought at Abra's Shop. If Pikachu touches it, it will lighten up. Fishing hook : A fishing hook used by Pikachu at the fishing ponds. Lucky hook : Another fishing hook with increased chance to catch better Pokémon. Harmonica : Earned after breaking the Piñata three times. It summons Lapras that takes the player and Pikachu to Cobalt Island. Megaphone : Professor Oak provides the player with the Megaphone, the day Pikachu goes missing. It can be used to interact with Pikachu from a farther distance or to knock down objects. Watering Can : Mainly used to water the Oddish. It can be baught at Abra's Shop. It comes in two types, a rather big red one that can hold a large amount of water and a small blue one that holds a little amount. Fishing Flags : Earned by achieving great scores at the different fishing missions. They are displayed on the wall of the player's room. A weird shop set by an Abra, which sells items ranging from common to special items. It can be found in two locations, which are the Springleaf Fields and the Ochre Woods. Sometimes Pikachu picks up and eats edible items by its own volition, instantly costing the player currency. A small mini game through which the player helps Pikachu guess the displayed Pokémon on the screen. The player has to clearly state the Pokémon's name. 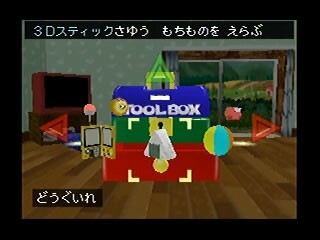 The mini game can be unlocked at the player's room if they tell Pikachu "Pokémon Quiz". The Pokémon Quiz mini game appears to be stored on a N64 cartridge in the players room, and it looks like there are multiple copies. 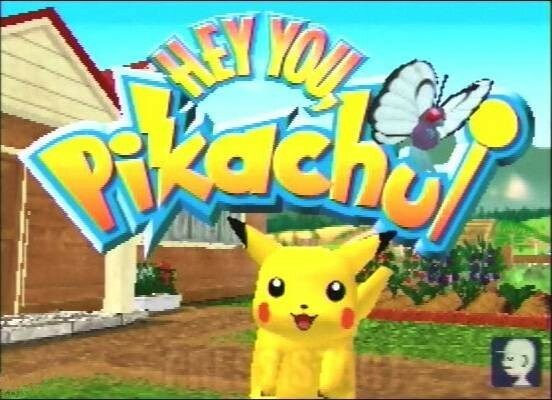 A selection of videos about Hey You, Pikachu on the Nintendo 64. 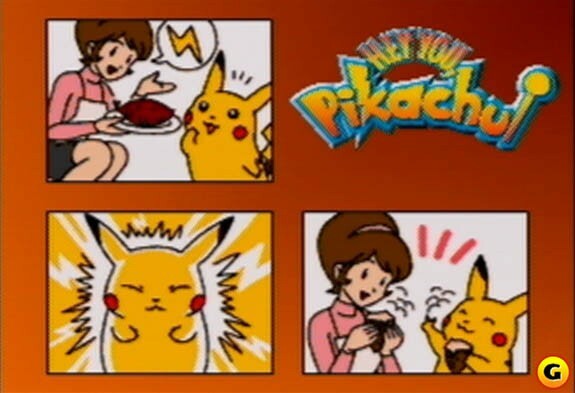 A Japanese TV Commercial for Hey You, Pikachu! 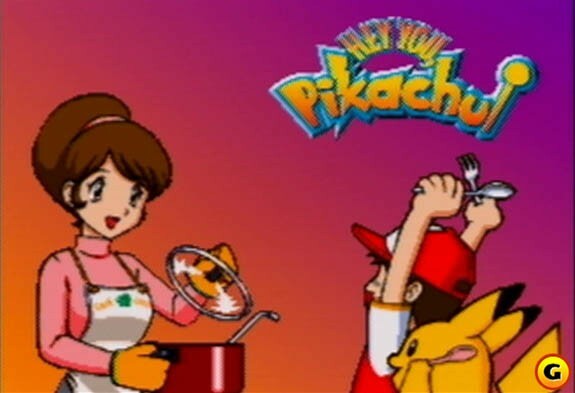 A U.S TV Commercial for Hey You, Pikachu! The 2nd U.S TV Commercial. If the player tells Pikachu "I hate you", it will get angry and leave the house. It will be back the next day, though. 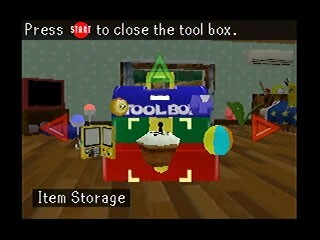 Some objects are affected by the player's voice. Like the toy that moves in his bedroom when he says "Toy". In the player's room, there's a coat rack on which Ash Ketchum's uniform can be seen. This brings us to the conclusion that the player might actually be Ash or maybe a fan. His cap is also used to cover Pikachu's eyes in the "Piñata Party". Sometimes Pokémon react to the Megaphone, running away from its noise. The plants displayed on the title screen are not available in game. The PokéPark games on Wii and Hey You, Pikachu! are the only Pokémon game that do not have Pokémon in their titles. Hey You, Pikachu! and Densha de Go! 64 are the only two Nintendo 64 games that use the VRU. In Japan the game is called ピカチュウげんきでちゅう Pikachu Genki Dechū which is a pun on ピカチュウげんきです, meaning "Pikachu is fine." 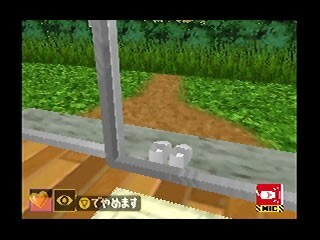 In the Japanese version of the game, the players shoes can be seen outside the patio doors, where in the U.S version they cannot. This is because in Japan, it pretty much goes without saying that people take off their shoes before entering their homes whereas in the U.S some people are a little more open to leaving them on! Similarly in the Item Storage box, the Japanese version contains a Rice Cake, where in the U.S version this has been replaced by a Cupcake. Although the game mainly targeted the young generation of Pokémon fans, it was fairly succesful, selling a great amount of copies, reaching a total sales of 1.83 million units of which 50.9% were sold in Japan. Fran Mirabella lll from IGN didn't like the game much as only the young audience would enjoy such game, quoting "I found this game to be extremely boring. It's good for some laughs for about 10 minutes". Yet, she still rated the game 6/10, which equates to "Okay" on their scale. Frank Provo liked the game a lot, grading it 8.3/10, the equivalent of "Great" on the GS scale. He still admitted thought that "Hey You, Pikachu! for the Nintendo 64 is a game that will likely be overlooked by people who consider themselves to be hard-core game players.". Hey You, Pikachu! also managed to get a fair score of 55.09% on GameRankings. Overall, the game did pretty well, and was a successful first experience, as a virtual pet Pokémon game. It actually led to the release of a similar game called Pokémon Channel.